As beautiful as it is functional, this ravioli rolling pin is handmade in the U.S. from sustainable hardwood. 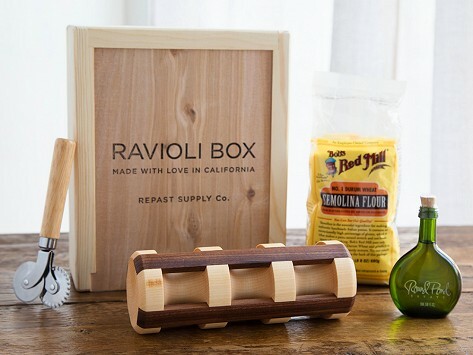 This wooden keepsake box contains a rolling pin, a ravioli cutter, flour, and olive oil to get you started on your way to making perfect ravioli. Dimensions: 10" x 8" x 3.5"
Making homemade ravioli can be intimidating, but it’s easier to master with Repast’s handcrafted rolling pin. Founder Michael Finizio is an engineer, woodworker, and foodie who loves bringing people together for a meal. (His company is named for the time during which a meal is eaten.) Michael wasn’t impressed with most ravioli rolling pins, so he created his own. Thoughtfully designed, this rolling pin is as much a piece of art as it is a kitchen tool. Repast believes in sustainable living, so each rolling pin is Made in the USA from hardwood. And for every tree they use, they plant 100 more. It won’t do everything for you, though—you’ll still need to make your own pasta sheets and filling. Spread filling across two thirds of one pasta sheet, then top with another. 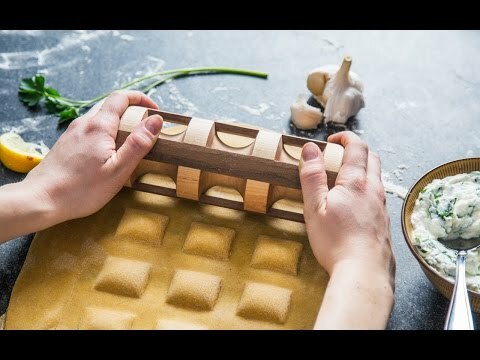 As you press the rolling pin firmly across the sheet, you’ll feel like a pasta master, watching deliciously plump ravioli form beneath your hands.